Sheffield's Graves Park provided the backdrop for the second fixture in the South Yorkshire Cross country League for the2013/4 season on Sunday with Rotherham Harriers hoping to consolidate their leading position in the senior events and improve on their third position in the juniors. The Harriers were represented by 48 athletes as 500 runners from 19 clubs fought out the places in races from Under 11 age groups to Vet Men Over 65. A very strong squad of senior men provided the club's two winners as Richard Harris (34:03) was victorious in the Over 40 category and Rob Tintinger (27:41) in the Over 65 race. Steph Burns (26:11) was unable to repeat her win in the Ladies Race as she was beaten into third place by guest runner and GB international Laura Weightman who took the honours ahead of former England international Julia Jagger. Grace Harris (13:42) and Declan Mullane (6:44) both improved on their third place finishes last time out to take 2nd places in the U13 Girls and U11 Boys respectively with Ryan Beale running a strong race to take another 2nd place finish in the Under 17 Men''s race. Matthew Stevens (15:38) was 3rd in the U13 boys and Kane Smith (16:14) repeated this feat in the U15 Boys. Mary Jenkinson (28:06) continued to show impressive progress as she took a personal best 6th place overall in the senior Women's race to be 2nd U20 woman home and Jess Mangham (29:23)was another athlete in fine form as she placed 11th overall in the same race to be 3rd U20 woman to finish. Janet Hindley (30:38) and Phillipa James (31:36) were 2nd and 3rd home in the Vet 45 ladies category to complete a pleasing total of 12 podium places for the Harriers. Particularly pleasing was the strong turnout in the younger age groups with 9 under 11 girls representing the club and the U13 Girls and Boys packing well in the top places to score well for the team. 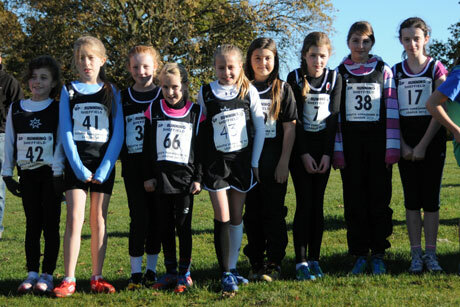 U 11 Girls - Nyah Barlow (7:36) 6th; Leah Hayward (7:39) 7th; Abby Stroughair (7:58) 14th; Eva Butler (9:08) 34th; Kate Towlerton (9:08) 35th; Georgina Bowman (9:13) 36th;Erin Brady (9:42) 44th; Marni Harris (10:14) 46th; Jessica Pink (10:37) 48th. U11 Boys - Declan Mullane (6:44) 2nd; Alex Coates (7:00) 7th; Fenn Russell (7:47) 23rd. U13 Girls - Grace Harris (13:42 ) 2nd; Mya Taylor (13:48) 4th; Annabel Johnson (14:25) 5th; Keiva Rennocks (15:01) 9th; Bronte Rennocks (15:27) 11th. U13 Boys - Matthew Stevens (15:38) 3rd; Bailey Stead (15:54) 6th; Jack Stokes (16:37) 8th; Howard Kniveton (18:20) 19th. U15 girls - Louise Oak (16:17) 17th; Ella Guy (17:09) 19th. U15 Boys - Kane Smith (16:14) 3rd; Declan Walker-Smith (16:33) 6th. U17 Men - Ryan Beale (23:38) 2nd; Daniel Bradford (25:14) 7th; Adam Green (27:10) 11th. Senior and Junior Ladies - Steph Burns (26:11) 3rd; Mary Jenkinson (28:06) 6th; Jess Mangham (29:23) 11th; Emma Parkinson (29:40) 14th and 4th U20; Emma Dutton (30:13)20th and 6th U20; Janet Hindley (30:38) 22nd; Philippa James (31:36) 30th. Senior and Junior Men - Richard Harris (34:03) 5th and 1st O40; Aidan Johnson (35:06) 9th; Kyle Craib (35:16) 12th; Elliot Smales (37:21) 27th; Connor Ryan (38:51)45th; Ricky Sharpe (40:42) 71st; Howard Darwin (41:13) 79th; Nick Wright (42:58) 98th; Matthew Jones (44:05) 110th; John Spencer (47:25) 141st; Martin Chivers (48:25) 147th; Stephen Cotter (49:01) 153rd. Veteran Men Over 65 - Rob Tintinger (27:41) 1st.